One of the reasons why iPads have been such a success in Science is that it offers a different way to demonstrate learning which is accessible to all students. All of the apps previously discussed on this blog has minimised writing and maximised learning, engagement and also creativity. I recently used iMovie with a Year 9 BTEC class and asked them to work in pairs to create a short documentary of a planet within the our solar system. Students were given a brief success criteria to follow but I wanted them to be creative. All students were engaged with the task and enjoyed having the freedom to create their film. Great pride was shown by all teams to create the best short film. I feel that this was more than usual and increased pride and engagement in the task was purely down to the use of the iPads, team work element and also the sense of freedom of the task. The iPads allowed the students to plan, shoot, edit and share their videos easily and high quality work was produced. • Transfer your iMovie project to your computer and compatible iOS devices. students and teachers to create your own unique shows with animation and audio in real time! Pick out your actors and backdrops, drag them on to the stage, and tap record. Your movements and audio will be recorded in real time for playback later. This app is as fun as your own creativity. Your creations are only limited by your imagination. – buy the director’s pass and receive ALL current and FUTURE content! Educational Uses – Groups of students can create a short video that can demonstrate their learning during the lesson.Students produce a short show as part of the lesson to demonstrate learning. This short video can be viewed by all during the plenary part of the lesson and then revisited at the start of the next lesson. Videos can also be exported to the Camera Roll, Uploaded to YouTube or shared via twitter. Solar Walk App for iPad, iPhone and iPod touch. Solar Walk is an excellent app for teaching astronomy to students with outstanding visualisations, short videos, information about all the planets in the solar system and a most impressive 3D feature that can be used to enrich the learning environment. This 3D Solar System model enables you to navigate through space and time, observe all the planets in close-up, learn their trajectories, inner structure, history of their exploration, points of interest and more. Use 3D mode to get a more realistic experience and zoom out to view and spin the entire Galaxy! I used this app recently when teaching Year 9 BTEC students about the composition of the Solar System and the some what unbelievable sizes of planets and our galaxy. Students where engaged from the start as I had chosen to project the animation of the solar system rotating slowly on the board as the pupils arrived. A darkened room and the music playing set the scene for the lesson and I was pleased and amazed by the engagement of the students throughout the lessons as this app made the lesson more accessible to all students. Students where required to research all of the different planets in the solar system and produce a scale drawing of the solar system by the end of the lesson. Some pupils struggled to finish all of the tasks however this was because the students were so engrossed in using the app and finding out more about our solar system. I would highly recommend this app to use while teaching because of the excellent realistic visualisations and also the excellent amount of information available to students at their fingertips all in one application. After showing Year 7 students how to use a light microscopes, I thought it would be beneficial for a group of students to be responsible for making a user manual that can be shared with their peers and also shown to the world via twitter. This demonstrated the learning that had occurred during the lesson and was a a very creative way of showing progress during the lesson. 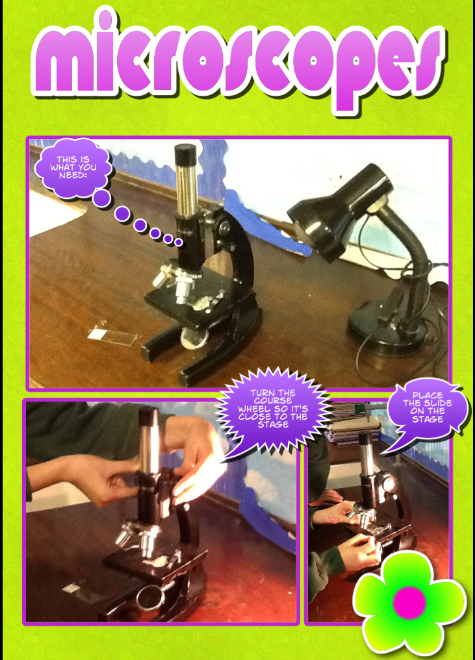 This User manual comic can now be used by other students in the school as a reminder when using microscopes and as a aid when peer teaching other students. Below are the images of each page produced by the Year 7 students which made up the User Manual comic. iPad Creative – iPad Creative Blog – 5 ways to start creating wonderful content with your new iPad.